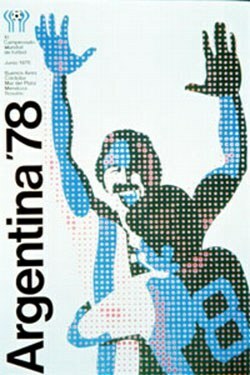 The eleventh World Cup was played in Argentina 1-25 June. A total of 107 national teams was involved in qualifications for the final tournament from which 15 would advance to the final tournament. For the first time only the host nation was automatically qualified and not the title holder (this rule has when lasted). For the world champion title would consequently 16 teams be competing (for the last time by the way, the following World Cup final tournament would be extended to 24 teams). West Germany was the reigning world championship, but this time without both Franz Beckenbauer and Gerd Müller. The runners-up from 1974, Netherlands, would also be without their biggest star, Johan Cruyff. The biggest expectations before the tournament were instead on players like Karl-Heinz Rummenigge (West Germany), Roberto Bettega (Italy), Rivelino in (Brazil), Michel Platini (France) and Mario Kempes (Argentina). The tournament would to some extent be overshadowed by political circumstances. The junta had taken over the power in Argentina two years earlier and they would use the event to benefit their own interests. The turbulent times in the country had not been ideal for the preparations and the organizing were far behind schedule, to the point that moving the whole tournament to Spain was considered by FIFA. But the new government would make drastic prioritization and, in the end, the tournamennt would go on as planned. The set-up that had been taken into practice 1974 with two group phases was copied. The best two teams from four groups would be gathered in another two four-team groups. From each of these groups would the winners meet in a final and the follow-ups would meet in the match for third price. The 1978 World Cup was played at six stadiums, in five cities. Estadio Monumental was the largest and would serve as the venues for the final and eight other games (including the majority of Argentina’s matches). Tons of white confetti were characteristic then the home team played. Tunisia’s victory over Mexico would mark the first time an African team won a match in a FIFA World Cup final. Argentina was because of the home advantage one of the favorites, but on the other hand, Argentina had much to prove since they lacked a big trophy in a global tournament. The belief in an offensive football by the charismatic coach Cesar Luís Menotti was combined with some unjust conducts. The less sympathetic features of the Argentinian team were featured in the match against Brazil. The rivalry between the teams produced a violent encounter in which the 0-0 result was symptomatic for a match that show little constructiveness. After the 0-0 draw between Argentina and Brazil in the second group phase, Brazil would go on by beating Poland with 3-1. As a result, Argentina was forced to win by a four goal margin in their last match. And they did more than that, beating Peru by six against nothing. Because of the circumstances and the result, the match has been controversial and by some claimed to the fixed. But the football journalist and historian Jonathan Wilson writes "It is doubtful that anybody watching the video of the game with no knowledge of context would see anything untoward". In fact Peru started the match aggressively and almost got the lead, and the performance from Argentina was sensational whereas Peru had nothing to play for. Thanks to that 6-0 win, Argentina won the group by goal difference and moved on to their first World Cup final since 1930. The final became somewhat ugly in aspects of brutal football. In a match that was dramatic in many aspects, the final outcome was delayed by 30 minutes extra time. In the added time, Argentina scored twice and it ended with a new defeat for the Netherlands and with the first World Cup victory for Argentina. The crowd cheered and Mario Kempes would be the biggest hero. 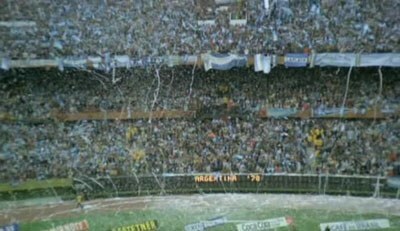 Most memorable was perhaps the characteristic images of the white confetti snowing at the home teams matches including the final. FIFA World Cup 1978 would include 38 matches in which 102 goals were made (2,68 goals per match). Three red cards and 65 yellow cards were shown during the tournament. Another statistical fact was that the opening match between West Germany and Poland was the fourth World Cup opening match in a row ending 0-0. Italy, Argentina, Poland, West Germany, Austria, Brazil, Peru and the Netherlands would advance from the first group phase. Netherlands and Argentina would win the groups in the second group phase, and therefore face each other in the final. The runners-up from the two groups, Italy and Brazil would play for the third place. Brazil would win the third place match with 2-1 against Italy and Argentina would win the final with 3-1 versus Netherlands.